RUSH: And once again, my friends, we have arrived safely at the end of another busy broadcast week, but we’re not finished. El Rushbo and the Golden EIB Microphone on Friday. RUSH: Yes, siree. And I’m sure you people are loaded for bear out there wanting to weigh in on things, and you better do it fast because the Drive-Bys are telling us that most of you have decided to swear off political conversations with family, friends, and enemies once we get to next week and Thanksgiving and into the holidays. Yes siree bob. We’re ready for you at 800-282-2882. Email address, ElRushbo@eibnet.us. Now, what does this tell you? I mean, realizing that every poll is intending to shape the news, not report it. Every poll is intended to make news, shape news, make or shape public opinion, not reflect it. What does this tell you? (interruption) Well, maybe. I mean, you’re accepting the premise of the poll. If you say, “Well, if people aren’t gonna talk, it means it’s so hot out there that people don’t want to go to war with –” You’re falling for it. That’s not what this means at all. Now, maybe I’m an eternal optimist; I know that I am an optimist. But this tells me that the media think that the political news is not currently in their favor. And that’s why they don’t want you talking about it. And the reason they do a poll saying, “The smart people are not gonna be talking about politics over the break” is to influence you not to talk about politics. Why would they want you not talking about politics? Because they must think it isn’t in their favor. Remember, during the salad days of the Obama years, every year around this time we had articles about how important it was to bring up the need for Obamacare. Remember Obama and everybody urging us to discuss Obamacare over the Thanksgiving meal or dinner. I know you had forgotten, but I haven’t. And, you see, that’s the difference. When they want you, when they think it’s in their best interests for you to talk about what they have been reporting, they urge you to do it. And Obama was joining the chorus, urging everybody to explain Obamacare to their family, to extol the virtues of Obamacare to their families. Or whatever other issues the Democrats were pushing at the time. They were always urging more family conversation. Now they’re telling everybody to shut up. Now, they’re not doing it directly. They’re saying you should shut up because most everybody else is not gonna be talking about this stuff, either. You have to know how to interpret these people. And I have become an expert. RUSH: My friends, I want to go back to the Reuters survey for just a moment where they’re saying that an increasing number of Americans are not gonna be talking politics this holiday season, and my opinion that the reason for that is they don’t want us talking politics ’cause the news is not in their favor. By the way, you can still hear me okay, right? I just dropped… My implant came off. (interruption) Okay. 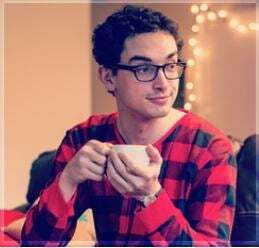 You remember Pajama Boy? The Pajama Boy ads were, in fact, created for the Talk About Obamacare over the Holidays Campaign. I’m looking at it right here. I went back to the Grooveyard of Forgotten News: “U.S. government spending on public relations campaigns, including NASA’s Green Ninja videos on global warming and the Pajama Boy ads for Obamacare… The government spent about $1 billion annually on advertising and public relations from 2006 to 2015,” and one of the campaigns was the Pajama Boy ad. This metrosexual-looking kid in his pajamas drinking hot chocolate. Wear pajamas, drink hot chocolate, talking about getting health insurance. And the website, BarackObama.com/Talk. 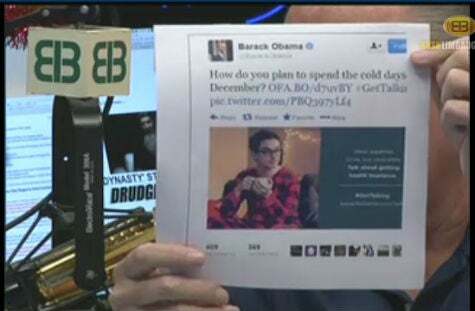 And another picture and finally another tweet from Obama: “How do you plan to spend the cold days of December? Get talking.” And it’s another picture of the Pajama Boy ad where he is encouraging everybody throughout the throughout the holidays to talk about, to encourage, to promote everybody signing up for Obamacare. So don’t doubt me on this stuff, folks, not when they’re putting out surveys saying that most Americans — at least a third of Americans — followed by an increasing numbers as we got closer to the holidays are not going to discuss politics. I’m telling you, when to use polling data to reflect opinion; they use it to shape it. And with all this news of Hollywood, Bill Clinton, Al Franken, sexual harassment, Democrat rank hypocrisy, I don’t think they want you talking about the news. So they publish a poll telling you that most people aren’t, hoping that you will simply follow along. Pajama Boy ads were created for this express purpose, for people to talk about Obamacare over the holidays.